Hugh Dancy (star of Evening and Confessions of a Shopaholic) is currently promoting his new film Adam that I am very much looking forward to seeing! In Adam, Dancy plays a young man with Asperger's Syndrome -- a type of Autism, which makes social interaction difficult -- who develops a relationship with his neighbor, played by Rose Byrne. It looks super charming and sweet. My cup of tea! 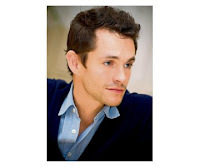 The reason I bring this up is that during a recent interview with the Irish Times, Dancy made a shout out to the film we cast him in that we are developing and for which we are putting together the financing right now. The film is called Art of Deception and it's about the famous Dutch art forger Han Van Meegeren. Here is a link to the article in the Irish Times. It always feels good to know the other people on board your projects are just as excited about the project as you are. So thanks Hugh! We can't wait to make the film!